While I’m not an all-out meal planner or prepper, I get down with the occasional mason jar lunch. Slow-cooked beans, quinoa, cheddar, and cilantro got me through many long days at the office; more recently I’ve been on a butternut squash, corn, beans, and kale mason jar salad kick (that creamy cashew-based vegan dressing is killer). But until recently, I hadn’t explored the world of mason jar soups. A goop article on the subject piqued my interest a while back, but I never got around to testing one of the recipes out, and I forgot about the concept. That is, until I was flipping through Nicole Pisani and Kate Adams’ The Ultimate Soup Cleanse: 60 Recipes to Reduce, Restore, Renew & Resolve which has a small section devoted to mason jar soup. Ok, back up, back up. Can’t you call any soup stored in a mason jar a “mason jar soup”? What makes a mason jar soup special? Well, like with mason jar salads, it’s all in the assembly. So-called mason jar soups leave out the liquid until just before consuming so that delicate ingredients don’t wilt or soak up too much liquid and turn to mush. (Think the soggy pasta in leftover chicken noodle soup.) Come lunchtime, simply add boiling water, let it sit for a minute, stir, transfer to a bowl, and eat. Since I’m writing about it, you’ve probably guessed that I’m on board with this lunch strategy. Not only is it a great way to keep delicate items fresh-tasting, but it also eliminates worries over leaks if you’re tucking that mason jar into your work bag. What’s particularly great about this recipe, is that by using a trio of bold ingredients (miso, kimchi, and scallions), it brings plenty of flavor while keeping the shopping list (and prep) super-short. 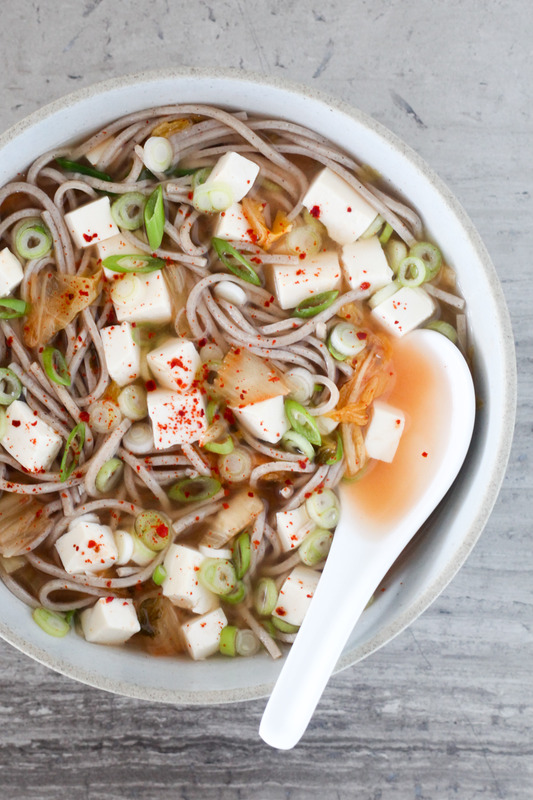 All in all it’s a mere five ingredients (silken tofu and soba noodles round it out), and it’s a speedy almost-no-cook situation (aside from boiling some soba noodles). Layer the ingredients in the order listed in a pint-sized mason jar. When ready to eat, fill the mason jar with near-boiling water, let sit for 1 minute, then carefully turn out into a bowl. Scrape out any remaining miso from the bottom of the jar into the bowl and stir with chopsticks to evenly distribute the miso throughout the soup. Eat hot. My preferred brand of kimchi is Mother In Law's House Napa Cabbage Kimchi. 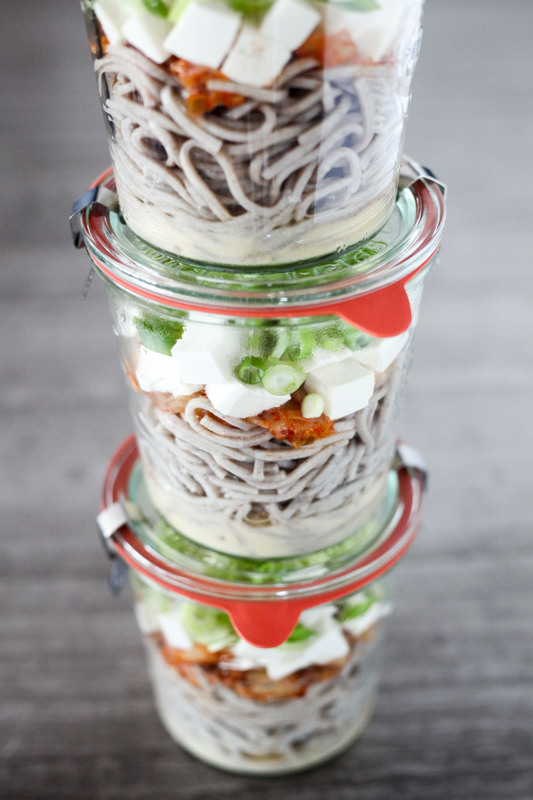 To make gluten-free, use 100%-buckwheat soba noodles and chickpea miso. 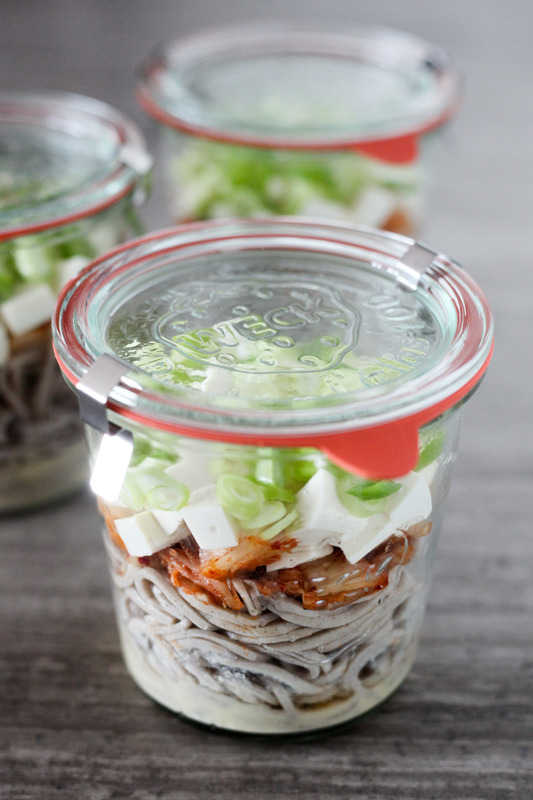 To make vegan, use vegetarian kimchi.